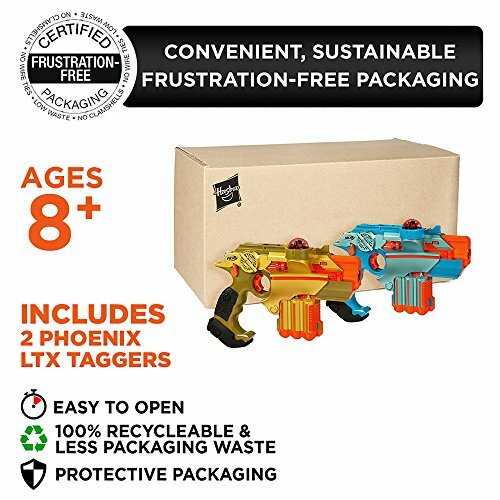 The Nerf Lazer Tag Phoenix LTX Tagger set has arguably been one of the most popular home laser tag sets since they came on the market in 2008. A lot of different types of laser tag guns and sets have tried to enter the home laser tag market in the last decade. But the Nerf Lazer Tag Phoenix LTX Taggers have always managed to sell very well. And that’s for very good reasons as we found out while having a closer look at these classic home laser tag guns. So why the name Lazer Tag, instead of Laser Tag? 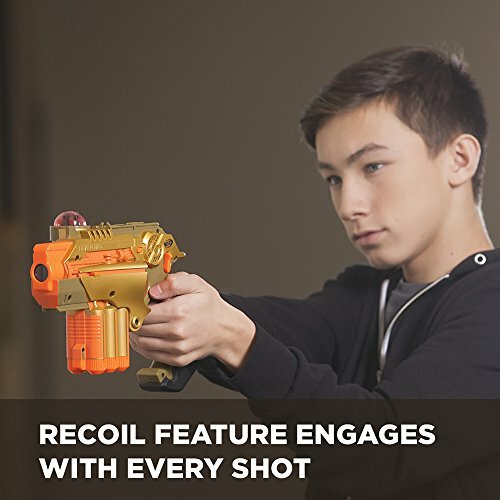 Lazer Tag is simply the commercial name for the line of Nerf laser tag blasters, just like Nerf has different names for each of their Nerf gun series. Lazer Tag was originally a brand founded by Tiger Electronics, an American toy manufacturer. Tiger initially had quite some success with their laser tag guns (aka “taggers”), such as with the Lazer Tag Team Ops laser tag set. Hasbro bought Tiger Electronics in 2006 and continued the Lazer Tag series. The Nerf Phoenix LTX set was released in 2008, and in that same year Hasbro decided to discontinue all other laser tag sets in the Lazer Tag series. Despite its success, the Phoenix LTX set and the Lazer Tag series were discontinued in 2012. But not to worry, they can still be found on Amazon and other online stores. Also in 2012, Hasbro announced a new laser tag set with smartphone technology, the Lazer Tag Augmented Reality set. These laser tag guns were released as a stand-alone product, seperate from the Nerf brand. Despite best efforts however, smartphone laser tag has never really become hugely popular. Will Nerf ever bring a brand new laser tag set to the market? We certainly hope so! With the Phoenix LTX tagger guns you can play in teams as well as in solo mode. The team game mode means you can play in 2 teams and battle against each other. You can’t tag people in your own team. The team mode works well if you have a minimum of 4 players. You can buy as many sets as you like and all the guns will be able to work together. The solo game mode basically means that each player is on his or her own, so you’re fighting against everyone else in the battle. This is the most popular mode because, realistically, teams aren’t usually going to be very big at home. Solo game mode can also be used with the video game module attachment, which is not included in the standard set. See further below to read more about this particular attachment. Before starting a game, all players will need to agree on a strength score. The strength switch can be set to 10 or to 25, which indicates how many times you can be tagged before you’re eliminated from the battle. Please note though that the strength switch cannot be changed during a game. The strength gauge indicates how many lives you have left in the game. The taggers also have an indoor/outdoor switch, depending on where you want to play your laser tag battle. You need to set this before you start the game and it impacts the levels of sensitivity of the guns and their sensors. Another great feature is the shield activation button. When your shield is activated, you can’t be tagged, but you can’t tag others either. This is a very tactical feature and should only be used if you end up in a certain situation. For example, if you feel that you need to run to the other side of the battlefield for tactical reasons, activate the shield so that you can’t get tagged. Be aware that you can only use a limited amount of shield time during a laser tag game. This basically means that you will need to think twice before pressing the shield activation button! The maximum shield time per activation button press is 10 seconds and the minimum time is 2 seconds. The ammo indicator tells you how much ammo you got left during play. This also means that you can’t just randomly tag people during a laser tag battle, so it’s important to properly aim at your enemies. The power core release button releases the power core so you can re-load once you’ve run out of ammo. You then need to manually press it back into you Phoenix LTX tagger gun to continue tagging. This feature is awesome because it makes the game feel a bit more realistic. To run these laser tag guns you do need to install 12 AA batteries which are not included. Twelve batteries sounds like a lot, and it is a lot, but the guns can run quite some time on full batteries. It should also be pointed out that in order to install the batteries, you actually need to use a screwdriver. It’s not all that hard, but it’s not as simple as pressing a button. Why was it designed this way? Probably because it’s important to make sure the batteries are safe and secure during battle. The below video gives you a good sense of how surprisingly sophisticated the Nerf Lazer Tag Phoenix guns really are. It also gives you a good idea of the size of these taggers, because they’re actually not as small as you may think they are. We were actually a bit surprised by the size of these guns first time we laid hands on them. And that’s a good thing, because the size and the robustness of these guns make them feel a touch more professional. The sound and light effects are also spot on. The Phoenix LTX Taggers really are cool laser tag guns that allow you to play very intense laser tag battles. But if you’re looking for even more features, you may want to consider buying separate attachments and accessories that are available for these particular laser tag guns. The Lazertag Multiplayer Battle System (see further below) is packaged with all of these extra attachments, but let’s first have a look at what kind of attachments you could add. The Shot Blast attachment available in the Battlepack pictured on the left. This is an accessory that you slide onto the front of your Phoenix LTX tagger. The purpose of the shot blast is to allow you to tag multiple targets at once and to boost your overall hits. Your tag range will be shorter with the shot blast attached, but because it’s also wider, you can actually hit multiple targets if they are close to one another. The indicator light on top of the tagger tells you when you get tagged and when you successfully tag a target. You can slide the Pinpoint Sight onto the accessory rail on the top of your Phoenix LTX tagger gun. This fancy attachment turns you into a real sharpshooter and will greatly improve your tagging accuracy. Use the green dot to pinpoint your target and tag all your enemies that come in your path. The Video Game Module accessory is great for single-player mode. All you need is a TV with AV input and you can practice your laser tagging skills by playing some epic laser tag battles on the big screen. The virtual laser tag games will blow you away and you’ll want to keep battling until you become the master of the game. As mentioned above, this battle system contains the two Phoenix LTX laser guns + the 3 attachments. But is it all worth it? The 3 attachments undoubtedly take these guns to a new level. These attachments are not just for show, they do add amazing value and make your next laser tag battle more intense and exciting. The drawback? The price tag is a bit high. As far as we know, you can’t buy this set as brand new anymore so it’s becoming a bit of a collector’s item. 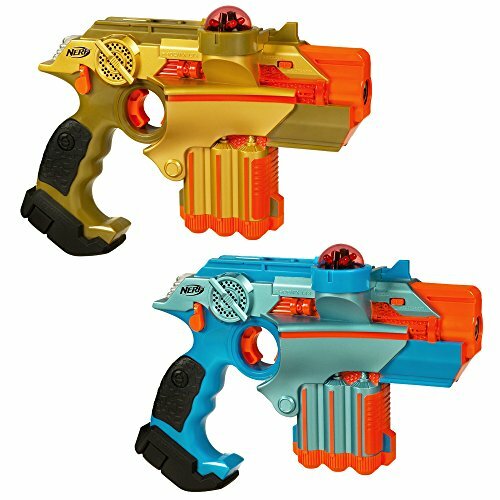 So you would need to think carefully whether you really want this set with the extra attachments, or if a set of 2 Nerf Phoenix LTX taggers is enough. After almost a decade on the market, the Nerf Lazer Tag Phoenix LTX Taggers are still going strong. Not many other laser tag guns have been able to outperform them. They really are amazing home laser tag guns, especially at that very competitive price. The taggers have a very robust feel to them, they are comfortable in the hands and the sound and light effects are perfect. Nothing over the top, simply spot on. These guns give you the opportunity to play an intense and semi-professional laser tag battle at home or outside in the park. In our opinion, the Lazertag Multiplayer Battle System is awesome but perhaps a bit overpriced. The extra attachments do add value but the extra money you will need to fork out is perhaps not justified for everyone. If you stick with a set of Nerf Lazer Tag Phoenix LTX Taggers, you will definitely not be disappointed. I have a question about this product. 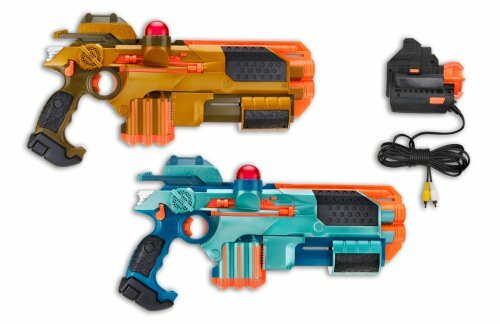 I’m stuck between either getting this one of the cheaper one also by nerf called alphapoint. Both sound solid but alphapoint does have a smartphone bluetooth connectivity. Can you guys do a review of the alphapoint as well? Thanks for reaching out! The Alphapoint set is on our radar to review. I would lean towards the Alphapoint right off the bat mostly because the LTX kits are no longer made, although still available. The big plus with the Alphapoint system that you mentioned is the Bluetooth device compatibility. This adds a whole new level of fun to the game in my opinion.